I have been writing a booklet about the stained glass at the Church of St Peter in Carmarthen, which is being published this month. The opportunity to write this short study raised a couple of intriguing questions regarding the attribution of two of the windows in the church. The window on the north side of the nave, depicting the Crucifixion and the Resurrection, had been attributed to the London firm Heaton, Butler & Bayne, but this did not appear to be correct according to what I have seen of their work around this date (1870). In considering other possibile makers of the window, I thought about Joseph Bell of Bristol. This long-lived firm made two windows in the south aisle of the same church, and one at the east end of this aisle, an area formerly used as a consistory court. This big east window was signed by Bell (1864), and the ones on the south side were either attributable to Bell from newspaper reports, or by clear stylistic parallels. 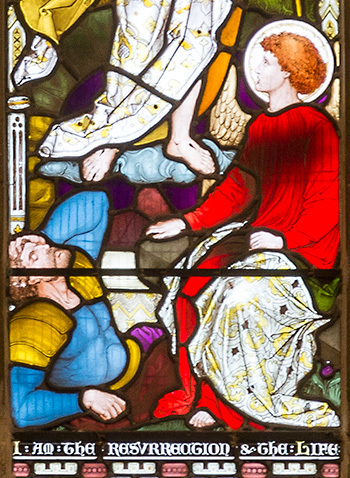 Although the style of the 1870 window is quite different from these earlier works, there were nonetheless parallels with the east window of Trinity College Chapel, Carmarthen, made by Joseph Bell in 1873. In both windows there are some similarities in the poses, lettering, the red halo used for Christ, and they have a darker, richer, palette. The contrast to the brighter colours and Neo-classical style of drawing found in the windows by Bell of the 1860s is nevertheless quite marked, and shows how a window could be very different from another made only six years earlier by the same studio. A further window at the church posed a more difficult problem. The window is situated between the Crucifixion and Resurrection window and a First World War memorial, which I had been able to attribute to Percy Bacon Brothers from the British Society of Master Glass Painters list of 1930, a detail of which was used in Stained Glass from Welsh Churches (2014). 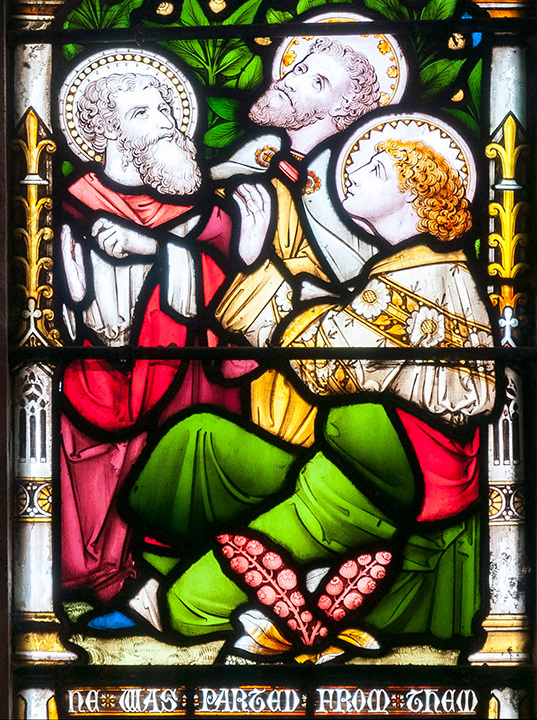 The main scene in the window, depicting Christ as the Good Shepherd with St Peter, looked markedly different from other windows that I have come across from this period, although the Gothic framing around it was very conventional. But I could not find anything else that seemed to match the style and identify the maker. Finally, I came across a newspaper report of the unveiling service which contained the information that I had sought, which came with a surprise: ‘The design which is in beautiful stained glass represents the Good Shepherd and also St. Peter with the Keys. A suitable inscription on a brass plate at the foot, completes the memorial, which was carried out by Mr W. B. Simpson, of Martin’s Lane, London’ (The Carmarthen Weekly Reporter, 2 October 1903, 4). At first I thought that this firm had only made the brass plate, but after reading it again it seemed likely that Simpson’s had made the plate and the window. However, I had not heard of the firm before, certainly not as makers of stained glass, so, having found a name, it was an unexpected one. Some further research revealed that they did indeed have a stained glass studio at St Martin’s Lane in London, and also that the artist Lewis Foreman Day had quite a long association with the firm, designing for their products in various media. Whether he was the designer, or how typical the window is of their output, has been impossible to easily assess, as I have yet to find any other images of their stained glass. The firm was apparently better known as producers of ceramic tiles, making many thousands of them for public buildings such as hospitals and theatres in the late nineteenth century, as well as the London Underground. I also found that I had come across their tiles already in Wales, as Simpson’s firm was responsible for tiles at St Asaph Cathedral, and made the pictorial tiled scheme designed by Horatio Walter Lonsdale depicting scenes from the First Book of Kings for the roof garden of the Bute Tower of Cardiff Castle. The Stained Glass of the Church of St Peter, Carmarthen, is now available from Sulien Books.